Social media certainly isn't new anymore and neither is the concept of companies and brands using it. Back when I started, there was no such thing as a social media manager. I've been at this for awhile and the one thing I've learned... is that there is always more to learn. 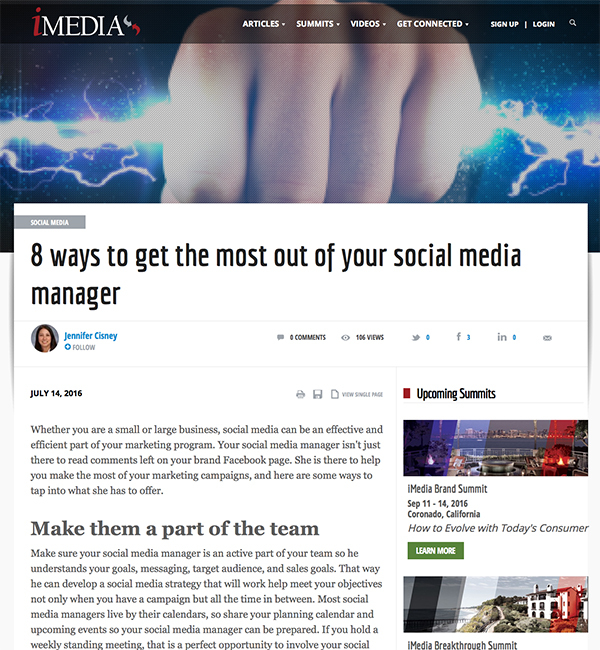 That's why I wrote this article for iMedia.com... 8 ways to get the most out of your social media manager. It maybe should have been 9. Bringing her cookies helps too. I am impressed and happy for all your work in sharing your ideas.Its a great work man.You are sharing post in an understanding level.I really wish to thank you for sharing it to us.Students can improve their academic writing skill by taking custom essay writing service help. hungry shark evolution hack device is commonly offered at this website, as well as player may also get the techniques to play the overall game as a story, a player may clear almost all level of this particular game correct a power generator to generate totally free hungry shark evolution gold and silver coins and limitless gems. I like this phrase: "is that there is always more to learn" because i'm absolutely agree. Good job ! You are very wise to give such information to the audience. So, continue your work and be helpful for others. Look in here research paper writer Thanks!